Very few people come into your life with a purpose to inspire without even realising it. For me that was Anthony Bourdain, he pushed the boundaries of what a TV show about food and travel could be, always with an insatiable curiosity and an unflagging respect for the people he met along the way. He inspired me to be inquisitive, seek compassion, and live life adventurously. 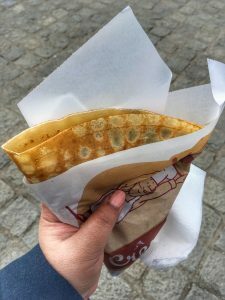 After watching his Paris episode on the show “The Layover”, we decided to plan an itinerary revolved around food and food alone. Living at least one trip in his footsteps or like he would. 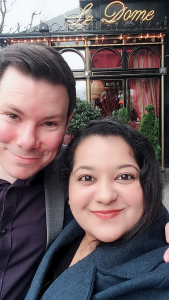 Damian got the hotel stay and I got the Eurostar tickets, for each other as Christmas gifts in December 2017 and we decided to head over for the Easter break in April 2018. I must warn you that this trip came at an extravagant price of £1000 which we racked up over 4 days. 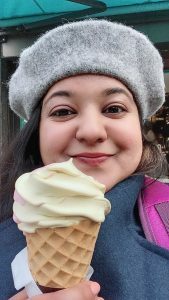 But in our defence, we were celebrating our first trip abroad since I arrived in the UK, my new job offer at the WWF and really, really good food. We set off for the city of lights based on recommendations by Anthony and another friend who frequented the city every year at fashion week. 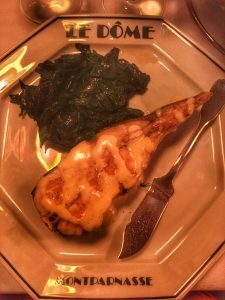 I’ve tried to break this post up based on location and sights and what to eat and find around it. Our first stop after having arrived and checked-in to our hotel was lunch at a Japanese restaurant called Miss Kô. 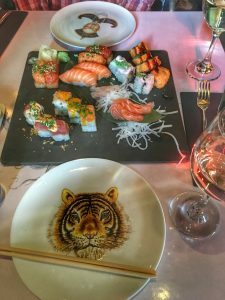 A friend (and everyone with an Instagram account) recommended this place for the pan-Asian food and celebrity spotting when in Paris. Sadly we didn’t spot any celebrities but the sushi platter split between us was fresh and delicious! It felt like being caught in a weird time-travel capsule where we were sat in Japan but everyone around us spoke French. All energised and pumped we decided to take a long walk around the lanes in Champs-Élysées. A li’l downpour of rain now and then led us to take shelter in the many cafes and stores along the high-street. I stopped at Jeff De Bruges for some brilliant ice cream and Damian stopped at Paul’s for a cup of coffee before standing in awe at a signal in the middle of the street to take in the Arc de Trompe, we had arrived! 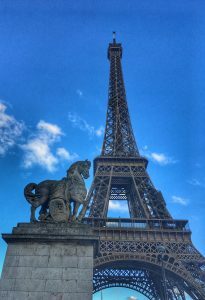 We then walked our way to the most distinctive symbol of Paris, the Eiffel Tower. With its graceful symmetry, this beautiful iron latticed tower has won the hearts of many and helped some win the hearts of others. Constantly seen as an iconic romantic moment in many Hollywood movies, I’d be lying if I said I didn’t dream of a proposal here as a young girl. If the architecture doesn’t float your boat, you should try and arrive here in the night to see how magical the lights look when they flicker. It sparkles like a giant Christmas tree for 5minutes every hour from dusk until 1 am. A few smooches and a million pictures later we decided to grab an early dinner, but Damian was on the hunt for Escargots which we eventually found in Passy. 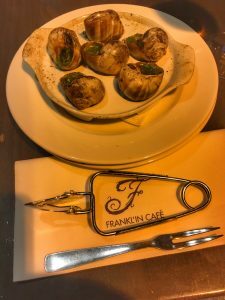 If you don’t know what Escargots are, hold on to your stomachs because it’s not everyone’s cup of…snails. Don’t be shocked because it was actually quite delicious and even a prude like me wouldn’t mind admitting it. They soak up the flavour of whatever sauce they’re cooked in so that is the key thing to remember. 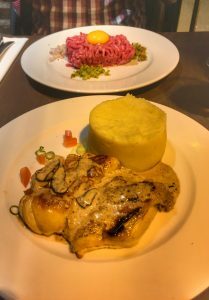 I had no reservations when it came to trying new foods in Paris, but for mains, I stuck to my chicken cooked in white wine and mushroom sauce, which was spectacular, while Damian enjoyed his beef tartare. Again, not everyone’s cup of…raw meat. We retired for the night, belly’s full and feet tired. 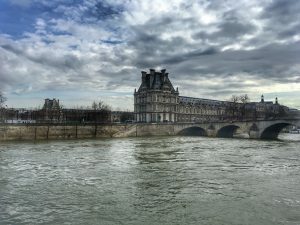 The views of Paris from the Seine are absolutely the best. 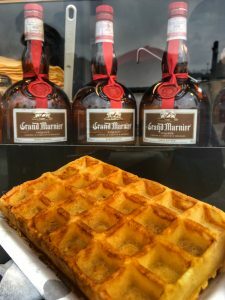 We grabbed some breakfast that consisted of crepes and waffles heavily doused in Grand Marnier (what a bloody brilliant invention!) as we wait for the boat. The Batobus and it’s eight stops links all the major sights on the river. If you have the time a two-day pass is recommended to truly discover what each stop has to offer. In high spirits, we boarded the boat and were on our way. As the boat passed under beautiful and ornate bridges we stepped out on the deck to take it all in. 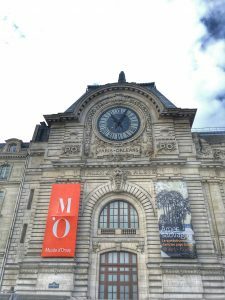 Our first momentary stop to change boats was at the Musee d’Orsay. The building looks gloriously archaic and well maintained. But a tour of this museum will have to wait until I’m back on a trip revolved around the museums. We arrived at the Notre Dame and nearly fainted looking at the long lines around it. 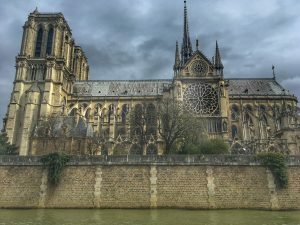 The great cathedral is never more majestic than when viewed from the left bank of the Seine, we took in its panoramic views from the boat and skipped across the street to Shakespeare and Company. Time for a pitstop of coffee, cake and books. Bibliophiles like me will spend at least a couple of hours in here. 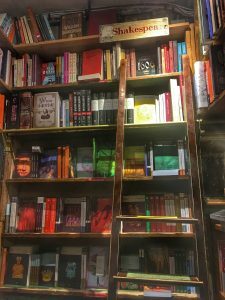 This renewed bookshop was once described by novelist Henry Miller as a “wonderland of books”. I exited happy with my stack of books and a copy each of The Little Prince and Stuart Little. Tiny’s got to read 😉 I shall be adding these to my reading list for 2018. 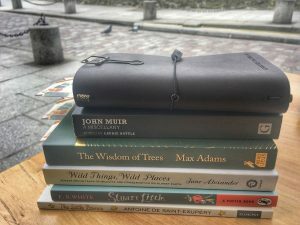 You can also read all about the 10 books I read in 2017. 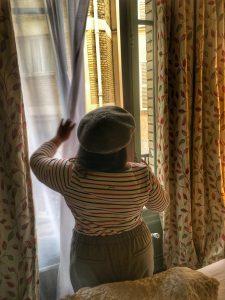 We walked through the streets that surround and I fill up my bag with some berets, a painting and some Frenchie dinner table mats. Tired, we decided to sit down to lunch and were accosted on the street into a tiny li’l wine cafe that served home-cooked French food. 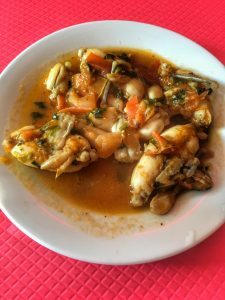 Once again Damian was in a mood to try something out of the ordinary and went for the frog legs or Cuisses de Grenouille. I tried one and it tasted and felt exactly like chicken. For mains I had the creamy salmon fillet which went rather well with the rosé the waiter helped me pair and for dessert, I had the profiteroles. How have I lived 29 years of life and not had this doughy goodness yet?! 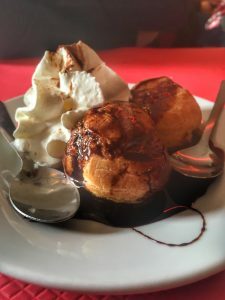 A profiterole, cream puff, or choux à la crème, is a filled French choux pastry ball with a typically sweet and moist filling of whipped cream. Bloody brilliant! 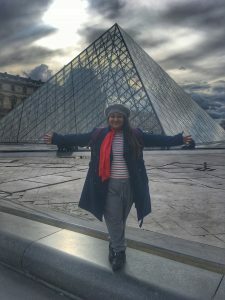 Belly’s full, back on the boat and next stop – The Louvre! 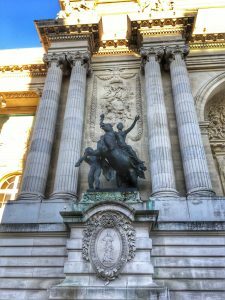 This grand museum stretches along the river from the Pond Royal to the Point des Arts. 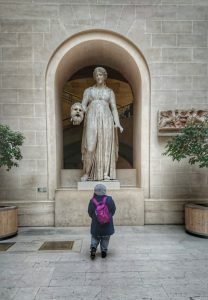 One of the world’s most impressive and largest museums, the Louvre contains some 35,000 priceless objects including The Mona Lisa, Glass Pyramid and Madonna and Child. Word of advice: 1) Buy your tickets online to beat the line. 2) Allow at least 3-4 hours to explore and 3) Pick a map as you enter so that you can be sure to see the main highlights. I was really glad to be here on the Easter weekend because they had a lot of paintings by Leonardo Da Vinci that depicted iconic scenes from the Bible and stories I had heard in church growing up. After 4 hours of a truly immersive experience, we decide to sit down for dinner with an advance reservation at Le Cafe Marly. 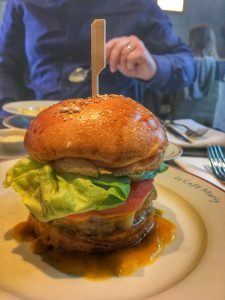 Superbly situated in the same complex as the Louvre, the cafe offers simple but expertly prepared brasserie fare, as well as delicious burgers and desserts. 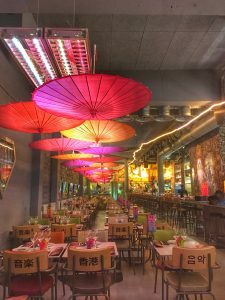 The dining room has a plush decor and velvet armchairs, but the best spot is outside under the arcade overlooking the glass pyramids that light up after sunset. Hence the reservation. For dinner, I had the “New Marly” cheeseburger while Damian had the truffle raviolis “Maison de la truffe”. Dessert was an extravagant Red fruit triffle that was bloody brilliant! 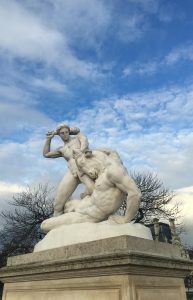 We worked off our splendid meal and pudding by taking a long walk through the Tuileries Garden. A stroll through here is one of the must-dos when in Paris. Before the revolution, this was a prime spot for the aristocracy to show off their latest fashions. It also houses some beautiful sculptures throughout the garden. At the far end is a hexagonal pool that everyone sits around to people watch and relax. Tired from all the walking for the last few days we decided to treat ourselves to a lay-in, we are on holiday after all! 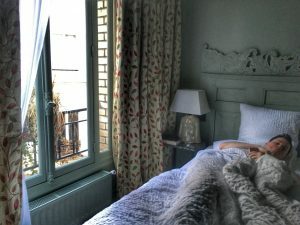 We woke around noon and enjoyed some madeleine and french press while lazing in bed, conserving our energy to paint the town red that night. 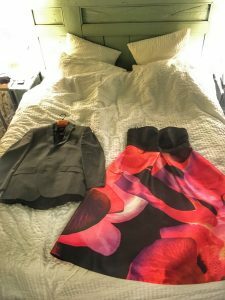 He put on his suit I put on my dress and we headed out for our reservation at Le Dome, Anthony Bourdain’s favourite place to eat when in Paris. 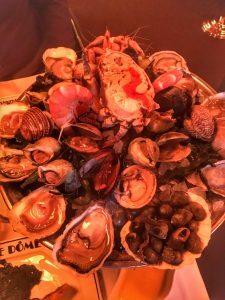 Prime seafood restaurant with great food and grand decor. Damian had the seafood platter, which was multi-layered, and I had the roasted turbot cooked in hollandaise sauce. It’s the most gloriously rich fish I’ve ever eaten. Bloody brilliant! 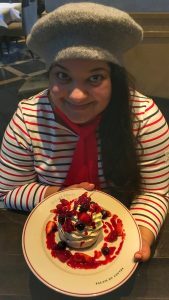 We shared the Mille-feuille between us for dessert and this was the first time I’d ever eaten it. 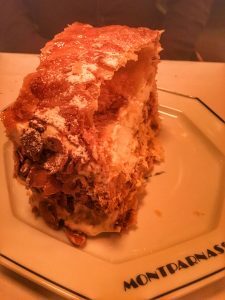 It is a rich cake consisting of thin layers of puff pastry filled with jam and cream and it was.. you guessed it.. bloody brilliant! 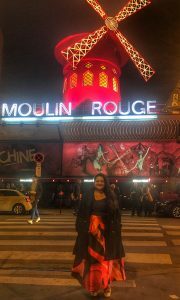 Belly’s full we head to the original home of the Can-Can, the Moulin Rouge (red windmill). As old as the Eiffel Tower (1889) cabaret is still performed here in the same razzamatazz that has been dazzling the audience since the times of Jane Avril. It was a spectacular performance with a free-flowing champagne party that ended at 2 am for us. 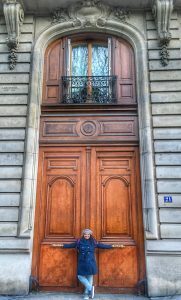 How can one justify coming to Paris and not tick the following off your list? Macaroons: Laduree is over-rated, go to Pierre Hermé for the city’s finest cakes, pastries and innovatively bloody brilliant macaroons. 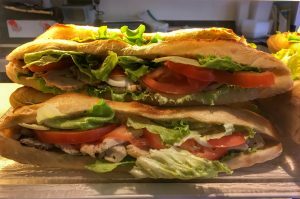 Baguette: All bakeries in Paris make a good baguette, we packed a few to take back home, but bloody brilliant bakeries make a baguette sandwich that can be enjoyed on your strolls. 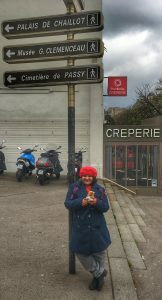 Pan Au Chocolat: Hunt down the nearest bakery to where ever you’re staying when in Paris and raid it for all things puff pastry. 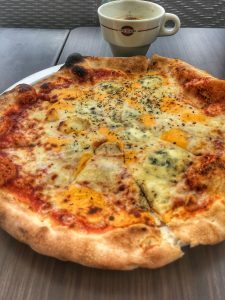 Cheese: I think another trip to the South of France is due just to stock up on our cheese cravings but the closest we came to it on this trip was a four cheese pizza, available almost everywhere. Our last day here was spent eating and walking and eating some more and walking lots more. Walk everywhere to find those hidden gems. You always made it look easy by engaging people at their human core, sharing food and a piece of their soul. 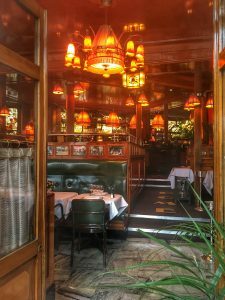 This entry was posted in Adventures, Food, Latest Articles and tagged Anthony Bourdain, Arc de Trompe, Batobus, Champs-Élysées, Crepes, Eiffel Tower, Flagrant Delice, Jardin des Tuileries, Jeff De Bruges, Le Cafe Marly, Le Dome, Le Franklin Passy, Miss Kô, Moulin Rouge, Musee d’Orsay, Musée du Louvre, Notre Dame, Paris, Paul, Shakespeare and Company, The Layover, Waffles. Bookmark the permalink. Oh wow it looks like yo had an amazing time. 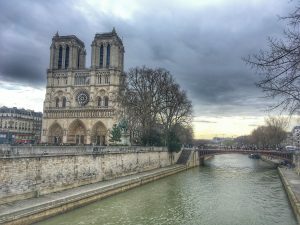 Shame the queue at Notre Dame was so long. Looks likeyou tried loads of yummy food whilst there. This is bloody amazing what u did in 4 days… everytime I read your blog post you keep inspiring me. Wow that’s a fab foodie experience and you saw so much too! Wow amazing photos! We LOVE Paris, I have had some of the best times of my life there, it’s my favourite city in the whole world! What a great post! 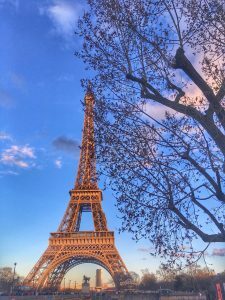 I’ve not been to Paris for a few years but this post has really made me want to go back! Oh wow I almost felt like I was in Paris there for a little bit! I haven’t been to Paris in an age and this really made me want to hop on the Eurostar there and savour it all! 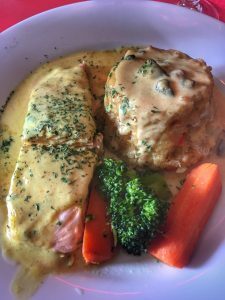 What an amazing post and all of those foodie photos! Luscious! What a great ode. I enjoyed reading this post. 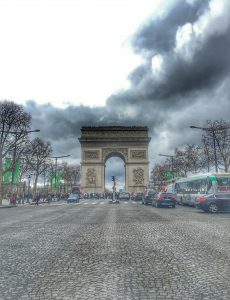 Visited Paris a few times. It is a lovely place. I would absolutely love to go there, you’re so lucky! It all looks incredible and your photos make me want to visit right now! Those photos are lovely! 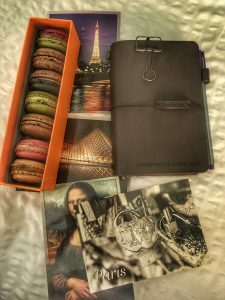 It’s obvious that you really had an awesome time in Paris.